Back in November of 2013, Google introduced an app called Google Opinion Rewards. We haven’t talked about the app much since, but because it has become a great source of funding for app purchases (like icon pack hotness), we figured it was time for a reminder that it exists. A lot has happened in two years, plus many of you are new around these parts and may not have known that Google was even doing a rewards/survey app that you could earn cash from. 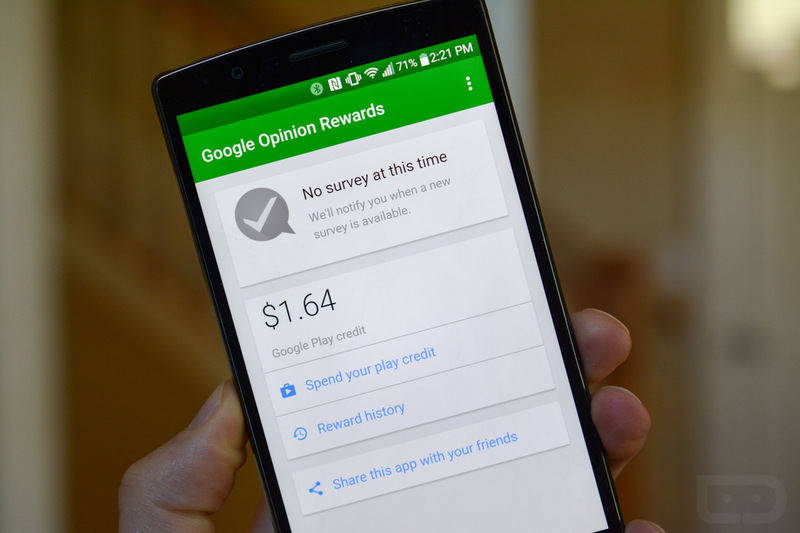 As a recap, Google Opinion Rewards is a survey app from Google that pays you for filling out short surveys. All you need to do is download and install the app, then fill out some basic info about yourself. Once you are setup, surveys randomly show up here or there focusing on a variety of topics. Some are single question surveys, while others can be four or five deep. When you complete a survey, Google will reward you with Play store credits. I can’t say that I have seen multiple-dollar rewards from a single survey, but don’t be surprised if you start building up a nice little credit pile after answering a few surveys worth $0.40 a piece. For those not new to the service, I’m curious – how much have you earned from Opinion Rewards? We were talking about it today and Tim is dominating me with earnings right around $41. I’m closing in on $20. Anyone hit the $100 mark yet?